Pirate ships would lower their flags when Puff roared out his name. oh! Painted wings and giant things make way for other toys. So Puff that mighty dragon, he slipped into his cave. oh! Puff the Magic Dragon is a song written by Leonard Lipton and Peter Yarrow, and made popular by Yarrow's group Peter, Paul and Mary in a 1963 recording. The song achieved great popularity. The lyrics for "Puff, the Magic Dragon" were based on a 1959 poem by Leonard Lipton, a 19-year-old Cornell University student. Lipton was inspired by an Ogden Nash poem titled "Custard the Dragon", about a "realio, trulio little pet dragon." The lyrics tell a story of the ageless dragon Puff and his playmate Jackie Paper, a little boy who grows up and loses interest in the imaginary adventures of childhood and leaves Puff alone and depressed. The story of the song takes place "by the sea" in the fictional land of Honalee (the spelling used by author Lenny Lipton, though nonauthoritative variations abound). Lipton was friends with Peter Yarrow's housemate when they were all students at Cornell. He used Yarrow's typewriter to get the poem out of his head. He then forgot about it until years later, when a friend called and told him Yarrow was looking for him, to give him credit for the lyrics. On making contact Yarrow gave Lipton half the songwriting credit, and he still gets royalties from the song. In an effort to be gender-neutral, Yarrow now sings the line "A dragon lives forever, but not so little boys" as "A dragon lives forever, but not so girls and boys." The original poem also had a verse that did not make it into the song. In it, Puff found another child and played with him after returning. Neither Yarrow nor Lipton remember the verse in any detail, and the paper that was left in Yarrow's typewriter in 1958 has since been lost. 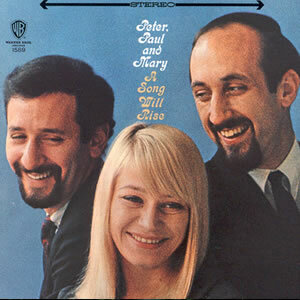 In 1961, Yarrow joined Paul Stookey and Mary Travers to form Peter, Paul and Mary. The group incorporated the song into their live performances before recording it in 1962; their 1962 recording of "Puff" reached number two on the Billboard Hot 100 chart and spent two weeks atop the Billboard easy listening chart in early 1963. It also reached number ten on Billboard's R&B chart.